In October 2008, professor Thomas F. Lüscher was appointed as the new editor in chief for the European Heart Journal. He and his team manage all editorial and administrative functions of the journal. Besides Circulation and the Journal of the American College of Cardiology, the European Heart Journal is the most important journal in cardiovascular medicine, with an impact factor of 23.425 (in 2017). It is an official Journal of the European Society of Cardiology and published weekly with a circulation of about 20’000 copies. The European Heart Journal aims to publish the highest quality material, both clinical and scientific. In addition to original papers on all aspects of cardiovascular medicine and surgery, the Journal also features Reviews, Clinical Perspectives, ESC Guidelines and editorial articles about recent developments in cardiology as well as encouraging correspondence from its readers. 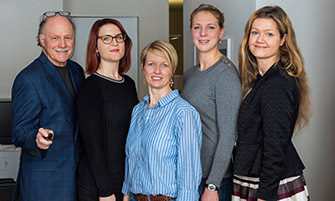 European Heart Journal Team, Editorial Office Zurich.